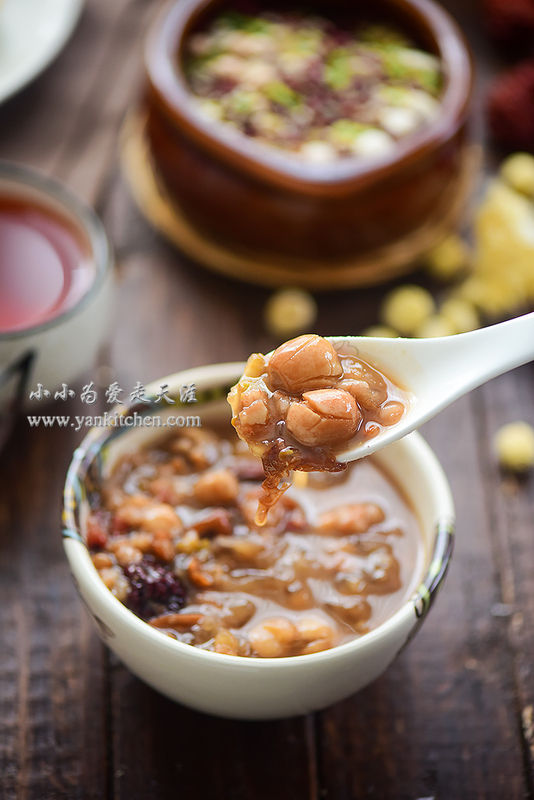 Sweet rice porridge with beans, nuts and dried fruits is a traditional dish to have on the 8th day of the last lunar month of the year in China. It is made with sweet rice, different kinds of beans and dried fruits to celebrate the end of the year and also a prayer for a better, more prosperous new year. The reason I like it is simple and strait forward: it tastes very good! O(∩_∩)O~ The porridge is usually simmered for a really long time before serving. So everything is smooth and well blended. The different sweet flavors and fragrances from dried fruits give the porridge a deep and rich flavor. What people put into the porridge differs from area to area. The usual ingredients are but not limited to sweet rice, peanuts, lotus seeds, dried jujubes, dried goji berries, dried longan fruits, red beans, pearl barley, crushed corns, dried chestnuts and some other nuts. You know it has to be tasty just by looking at all the amazing ingredients, right? I live in a small Michigan town where it is very hard to find all the usual ingredients needed for the porridge. So I improvise a little bit when making this traditional porridge dish. It turns out fantastic! It is feeds 2 to 3 persons. I usually mix a large batch and store in the refrigerator. So I can save a lot of time measuring and mixing all the ingredients. Lotus seeds are a very widely used and important ingredient in Asian dessert. When cooked, they have a very mild nutty flavor and a similar texture to cooked lima beans. Rock candy/sugar is made from cane sugar. It is also widely used in Asian desserts and cooking. It tastes pretty much just like the regular cane sugar. Dried jujubes and white wood fugus. Don’t be intimidated by the names. They both are actually quite tasty. Dried jujubes have a mild nutty flavor. They are sweet, nutritious and high in fiber. They are added to soups and porridge for colors and flavors. White wood fugus can make the soup or porridge silky and more smooth. It is very mild flavor. It is usually added to soup or porridge to improve the texture. It is said that wood fugus contains high value in nutrition. Dried longan fruits. They are pretty much only available in Asian grocery stores. Fresh longan fruits are white, juicy and sweet. Dried longan fruits have a mild nutty fruity sweet flavor. They become yellow or light brown when dried. I usually make the porridge for breakfast. The night before, I rinse all the ingredients once or twice. In a small Crockpot/ slow cooker, add all the ingredients but dried jujubes, dried longan fruits and rock candy/ sugar; and then add water. Set the slow cooker to high; stir everything together with a wooden spoon. Cover and then go to bed. The next morning, add dried jujubes, dried longan fruits and rock candy/ sugar. Stir again with a wooden spoon. Cover and cook for another hour. Now it is time to enjoy! I like to serve it immediately. The hot porridge will definitely warm up your stomach and the whole body.